There is no evidence to support claims that there are dangers of microwave food to your health when you follow safety guidelines. However, further research could validate the current expert opinion that, though exposure to high levels of microwaves can injure your tissues, they do not cause harmful effects on your food. Microwave energy heats and cooks food indirectly by vigorously agitating the water and other molecules in food, causing them to vibrate quickly and generate heat or thermal energy. There are ongoing myths and questions about adverse effects of microwaves on food. Without supportive evidence, some authors claim that, in addition to the heating effect, microwave cooking has a "radiation effect" on food. The myth is that microwave cooking fragments, "violently destroys," and transforms food molecules into toxic, cancer-causing substances. There is no evidence for this "microwave radiation effect" on food, according to a World Health Organization (WHO) review. Food "does not become 'radioactive' " when cooked in a microwave, nor does it retain microwaves when you turn off the oven. In addition, although there are dangers of additives and preservatives in prepackaged, microwave foods, there is no evidence that microwave cooking transforms these chemicals into toxic substances. There are also questions about depletion of healthy food nutrients during microwave cooking. However, a Harvard Health review states that there is no evidence that microwaving food decreases its nutritional value. In fact, compared to conventional cooking, microwaves cook food quickly in little water, so there is less chance for destruction or leeching of vitamins and minerals into the water. There is also little evidence that nutrients are lost if breast milk or infant formula is heated in the microwave. 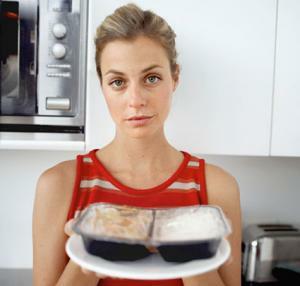 Undercooked food: Parts of the food may be undercooked when you remove it from the oven. This presents the danger of consuming unkilled bacteria if the thick foods are not allowed to "rest" to distribute heat evenly before eating. Random hot spots: Uneven heating can create random hot spots within the food that you might be unaware of. These spots can burn you if you eat food immediately from the oven. This is of particular concern for the potential to burn an infant's throat if his milk is heated in the microwave. Super-heated spots: Super-heated hot spots can be present in liquids that don't appear to be boiling on the surface but erupt when you introduce a spoon or other object, causing severe burns. Food explosion: Certain foods such as hot dogs and eggs that cook unevenly and can't vent steam can explode in the oven and potentially cause injury. Pre-packaged food containers: The containers that pre-packaged microwave food comes in are regulated for microwave safety by FDA standards. Unless they burn in the microwave, there should be no danger of leeching chemicals into foods. Don't reuse these containers for any microwave reheating or cooking. Plastic cookware: Plastic microwave cookware should have a "microwave safe" label. Other plastic containers may contain synthetic chemicals, such as bisphenol A (BPA, which can be harmful if they leech into foods during microwave cooking, according to the National Institutes of Health (NIH)). This is of most concern in infants and children. Do not heat their milk or food in any plastic containers. Other containers: Glass and ceramics containers, wax or parchment paper, and white paper towels are considered safe for microwaving with little concern for toxic chemicals getting in your food. Microwaves are part of the electromagnetic spectrum all around us. They exist on the lower energy, radio wave end of the spectrum and are far less powerful than x-rays at the other end. For your microwave oven, microwaves are generated artificially from your household electric power by a unit in the oven. Large levels of microwave radiation can heat water-containing human tissue and damage cells. However, there are no human studies on the effects of exposure to low levels of microwaves during cooking. There is also no evidence that when using a safe microwave oven with safety precautions, you are likely to be exposed to harmful levels of microwave radiation. The United States Food and Drug Administration (FDA) has strict safety regulations on the manufacture of microwave ovens and the levels of artificial microwaves they generate. According to the FDA, the risk of an intact microwave oven leaking damaging levels of microwaves is low if an oven is made to their strict standards. Safety mechanisms include interlocks to prevent generation of microwaves when the oven is open. According to the FDA, at two inches from an oven made to their standards, the microwave radiation is far below that known to cause harm to humans. In addition, the further you move away from the oven, the less the potential for harmful radiation. Likewise, there is no radiation once the microwave stops, and you open the door. Use microwave safe containers. If you use plastic or styrofoam containers, make sure they are safe for microwaving food or liquids. Plastic covers and plastic wraps should also be microwave-safe. Don't use containers that are burned or scratched. Don't re-microwave used prepackaged food containers. Never use a metal container, which can reflect microwaves and damage the oven interior. To avoid hot spots, cook food on a rotating tray and stir it half way during cooking. Make sure that food is thoroughly cooked by letting it rest a few minutes before eating. To decrease burns to the container, be sure you don't overcook or overheat foods. Make sure your oven meets FDA safety regulations. The seals around the oven opening and door should be intact with no defects. Don't stand close to the microwave while it's on. Microwave heating and cooking is quick, easy and safe under current guidelines. There is no compelling evidence that it destroys food molecules or nutrients, so enjoy the convenience of the method. Be sure to follow all food safety precautions and protect yourself from unsafe levels of microwave radiation during the cooking process.